Slender Man stabbing: Fox News says girls are "more likely to have hateful little minds." I think this is much more probably about immature [sic], hatred, jealousy, narcissism, and probably coupled with insufficient parenting—probably what we have here are a couple morally underdeveloped, hateful, jealous, little minds with insufficient supervision and parenting. It’s probably a more run-of-the-mill attempted murder really. That makes sense. We don’t have enough information right now to know for sure what the girls’ motives were, but Russell seems to be trying to prevent unnecessary panic by speculating that the “reasons” are more likely to be personal issues than the terrible influence of the internet. 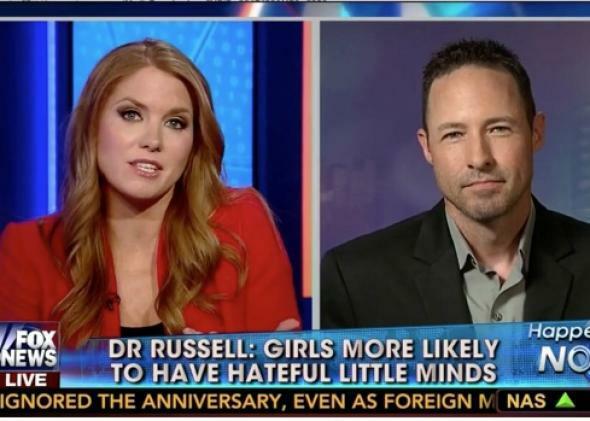 Needless to say, Russell never said that girls are “more likely” to have hateful minds or be prone to violence than boys, as this chyron implies. He was only addressing these two girls. However, since someone at Fox News seems confused on this, here’s a clarification: Not only does the evidence show that girls are no more likely to be “mean girls” than boys are likely to be “mean boys,” but juvenile arrest records show that girls are far less likely to be violent. As Melissa Dahl at Science of Us explained, only 8 percent of juveniles convicted of murder are girls. Interestingly, the expert that Dahl interviewed, criminologist Kathleen M. Heide, said that girls are more likely to kill someone they know to resolve a personal conflict, whereas boys are more likely to kill strangers in the commission of another crime. This fits into what Russell was saying about this particular attempted murder and its likely motivations.